Apple in iOS 12 introduced a new Shortcuts app, built on the Workflow app that it acquired in 2017. Shortcuts lets you automate tasks, simplifying everything from calculating a tip to sharing an Apple Music song. Shortcuts can do an endless number of things, but it can be tough to find useful new Shortcuts if you're not well versed in building them yourself. MacStories' Federico Viticci, known for creating useful Shortcuts, this morning announced a collection of Shortcuts that he's created over the years. The MacStories Shortcuts archive includes 150 shortcuts at launch, but Viticci plans to add more over time. The archive is neatly organized into various categories, and everything is available for free. 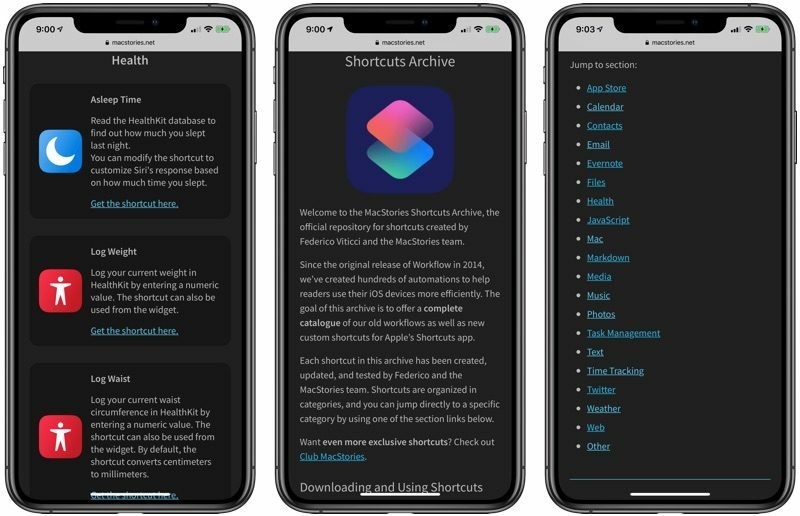 MacStories says that anyone is free to download, modify, and redistribute shortcuts from the archive to meet their needs. Viticci updated and adapted all of the shortcuts that he's been using in the Workflow app for years, so this is a robust collection filled with automations for developers, writers, and the average iPhone user. There are shortcuts for copying App Store release notes, saving screenshots, getting affiliate links, and more, and that's just in the App Store section. Other useful shortcuts include a file downloader for iCloud Drive, a PDF creation tool, an option for zipping a collection of files, logging weight in the Health app, calculating average heart rate for the last two weeks, adding frames to screenshots from Apple products, getting images from a webpage, and many more. If you want additional shortcuts, the Shortcuts subreddit on Reddit is also an excellent resource for finding new content in addition to the MacStories archive. Can someone enlighten me as to why you need some of these shortcuts? It seems to me the functionality is already built in for a lot of these. I've seen some very complicated shortcuts for very specific use cases, but many of these seem too simple to need. For example, one of the shortcuts listed gives the weather forecast for the day. "Hey Siri, what's the weather for today" does the same thing. Why do I need a shortcut? Oh boy. There’s a strong possibility you’ll be receiving a few more of my mirror pictures in weird and wonderful poses. Ever seen an oiled man flexing next to a television remote? The most useful one I’ve found so far is sending a mass text without forming a group chat. I'm looking for a shortcut to go to the App Store and automatically install all available app updates. Having to do this manually every day is a pain. Any ideas?